Check that candy: Here's what to look for. ST. LOUIS — Keep an eye out for drug-laced candy disguised to look like the real thing this Halloween—that’s the warning from the Drug Enforcement Administration to St. Louis area trick-or-treaters. Special Agent in Charge William J. Callahan sent the warning to law enforcement in Missouri, Southern Illinois and Kansas. There is no specific case or threat, but the Midwest has seen an increase in drug-laced candies, the DEA said. The candies look like the Reese’s, Milky Ways and Jolly Ranchers we all know and love, but the packaging is altered with names like Rasta Reese’s, Munchy Way and Stoney Rancher—and the candy inside has marijuana or meth. The DEA shared photos of what parents, loved ones and kids should look for. The candies have labels that look like the original logos—and in some cases they use the trademarked logo—but they’re packaged in new wrappers. 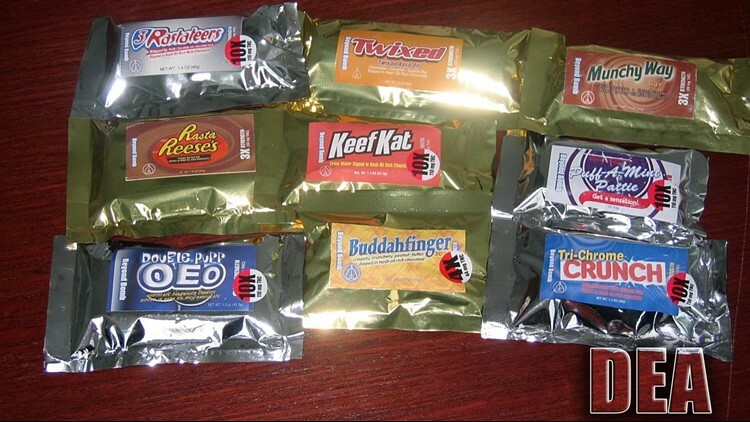 The agency said last Halloween if found marijuana-laced candies in packages designed to look like traditional chocolates, cookies and sweets, but the DEA didn’t say where it found the illegal sweets. “Marijuana-laced or Methamphetamine-laced candies can go undetected, but have harmful effects on our children if ingested,” warned SAC Callahan. “Halloween is a time for kids to be kids and have fun with family and friends. We don’t want anyone falling prey to an avoidable tragedy. Please check your candy closely. If you come across any suspicious treats that have unusual wrapping or misspelled candy labels give it to your local police department." Anyone who comes across suspicious looking candy is urged to call their local police department immediately. Just last week, the Dublin Police Department in Georgia put out a similar warning, after finding meth inside candy. "Just last week, we seized some drugs [methamphetamine] and it looked just like SweeTARTs," Police Chief Tim Chatman said.